flip a coin, if heads the attack is moved to 300 damage and the target is paralyzed. Comments : this is one of the best cards! this pokemon counts as two. When one pokemon faints the move that belongs to the fainted pokemon is no longer usable. 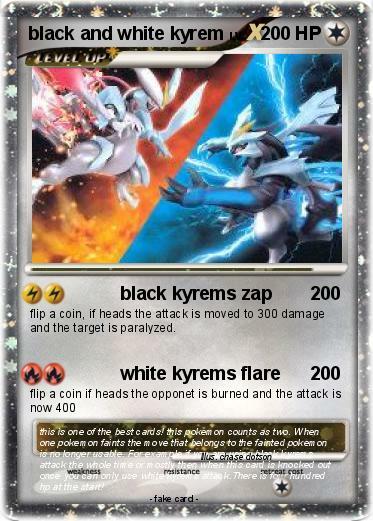 For example if you are using black kyrems attack the whole time or mostly then when this card is knocked out once you can only use white kyrems attack.There is four hundred hp at the start!